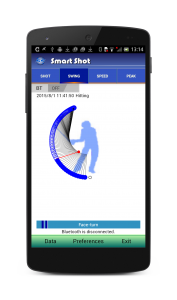 An innovative golf driver “SmartShot” is released. We have used the scientific method to explore “the sense of identifying the golf head core” which every player has had with an ambiguous feeling, and achieved the “visible sense” by combining a golf driver with a mobile device. 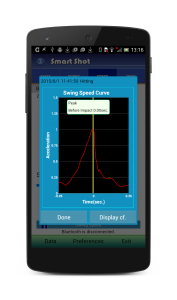 You can immediately identify your hit point, swing and difference by swinging SmartShot. 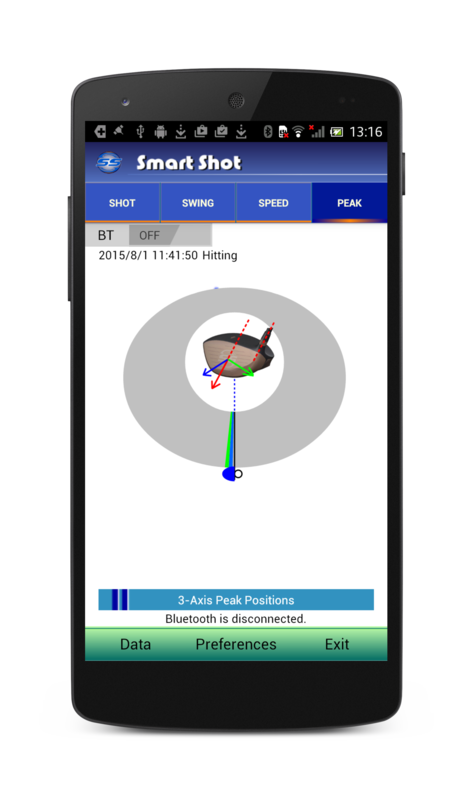 Use a mobile device to check a hit point and swing. The specifications are equivalent to those of the clubs for competition use. Play a round of golf with SmartShot. Identify your own habits and trends. Please see “specifications” for further details. — The hit point on the face is displayed immediately when you drive. — The speed and swing are displayed by charts and a graphs. The comparison with advanced golfers is possible, too. — You can identify hit data later. You can look in a mass for a day also. — You can attach place information of hit and the memo. There are other many convenient functions. Hit the ball at the core of the head allows the ball further!. The sense of “hit the ball core in the most efficient way” is more important than the club. 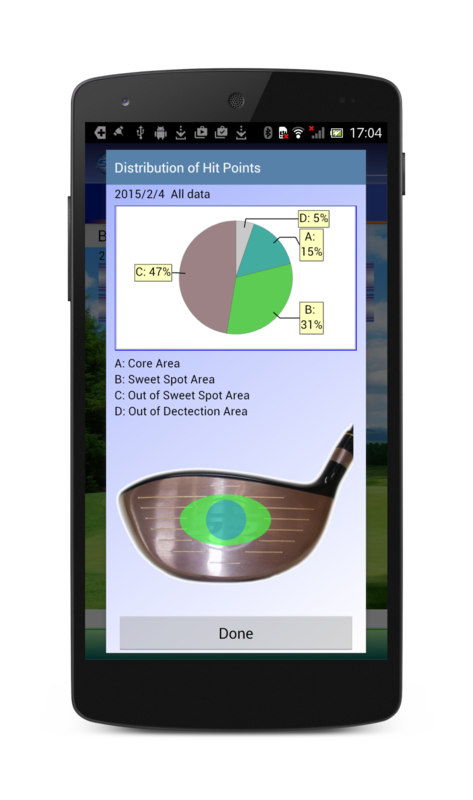 We have challenged to explore “the sense of identifying the golf ball core” in a scientific way and develop the products which can offer such a sense to golf players. We have developed the world’s first sensor detecting a driving point of the club face. This technology was patented not only in Japan but also in other countries around the world. All the technologies including the sensor are equipped with the club. The club looks like a normal club. In addition to being equipped with those technologies, the weight and balance of the club are equivalent to those of the latest clubs for competition use. This club has no switch. 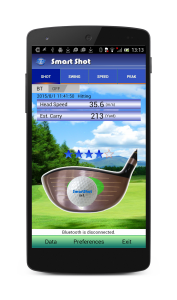 When you swing the club, the sensor will be automatically activated and send the outputs to your mobile device. The latest technologies are adopted to the club design. 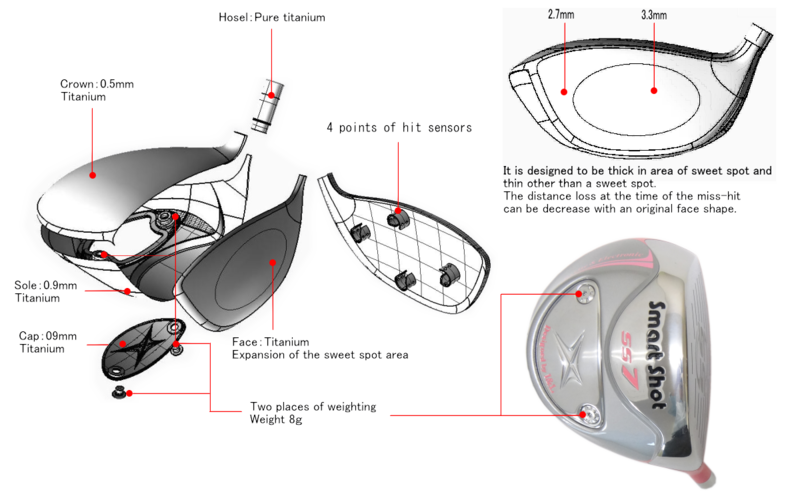 The head of the club is designed to be large, and to generate the low spin trajectory with a shallow center of gravity. The unique design of the face provides a widened rebound area, reducing distance loss due to a mis-hit. Regarding a mobile device, you can use smartphones, iPhones and Android tablets. They show the outputs with charts and graphs. 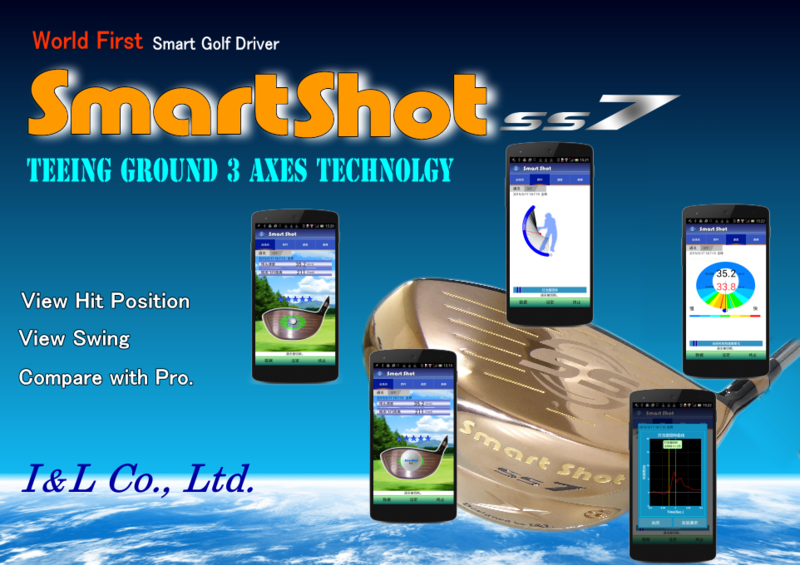 Thus, a mobile device-combined driver “SmartShot” has been created. Your Golf Life Will Change! 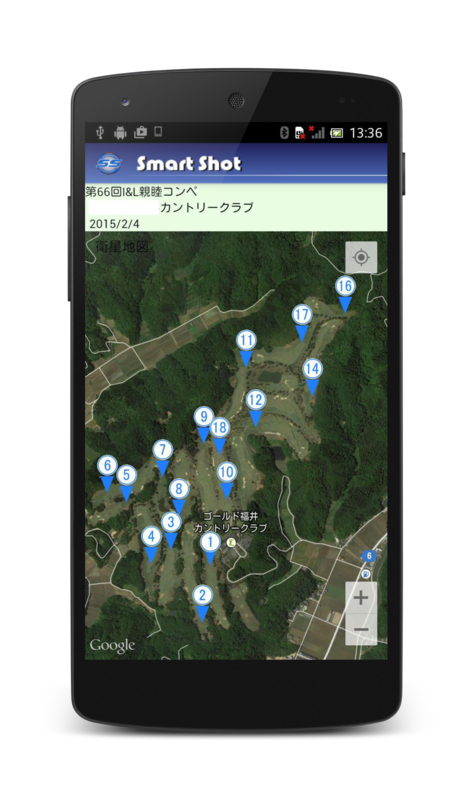 The data recorded in a practice ground and the golf course can be stored as datalog. 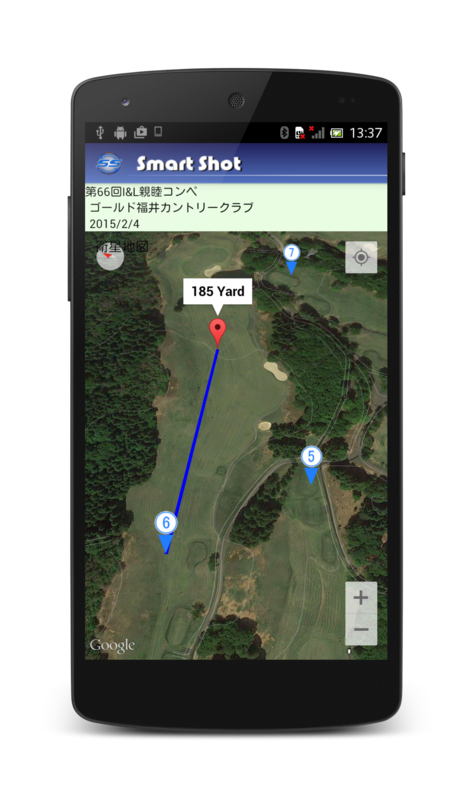 SmartShot offers a wide range of golf enjoyments such as checking the data at home, playing the leading part in a discussion on golf with your friends, and considering the practice method with your instructor. The image shown below is a smartphone screen. SmartShot has no switch. 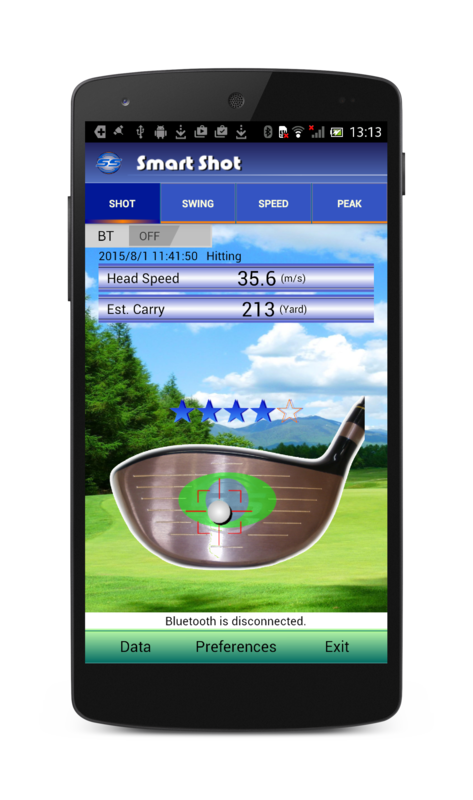 When you swing it, the sensor will be automatically activated and send the detected data to your mobile device. Thus, you do not need to turn on the switch every time you swing, or will not forget to turn on the switch. It detects a hit point and shows it on the screen of your mobile device. 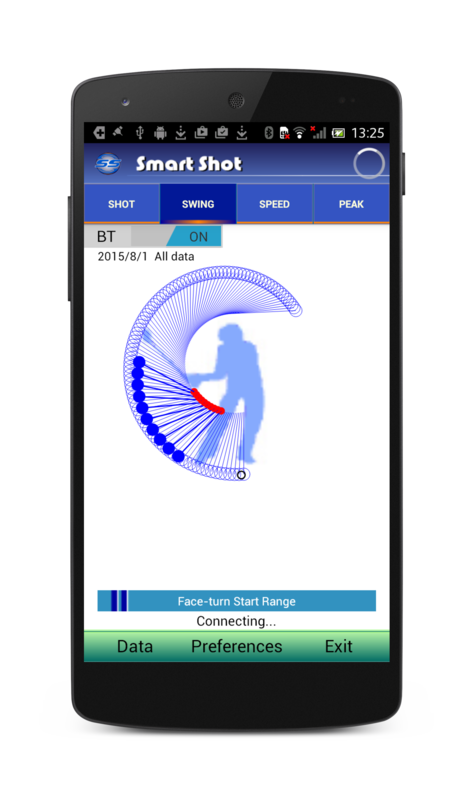 The face is divided into three areas: “Core” (blue), “Sweet Spot” (green) and “Surrounding.” You can check which area of the face hits the ball by seeing the screen of your mobile device. Moreover, different sounds or melodies are released according to the areas if you set up the sounds. The club head speed is displayed (m/s) on the screen. The estimated driving distance is also displayed (yard). A rating on a 5-point scale is given to your hit according to the driving point and head speed. The start time of face rotation is displayed as a figure. Moreover, the rotating process is displayed as a curve graph. 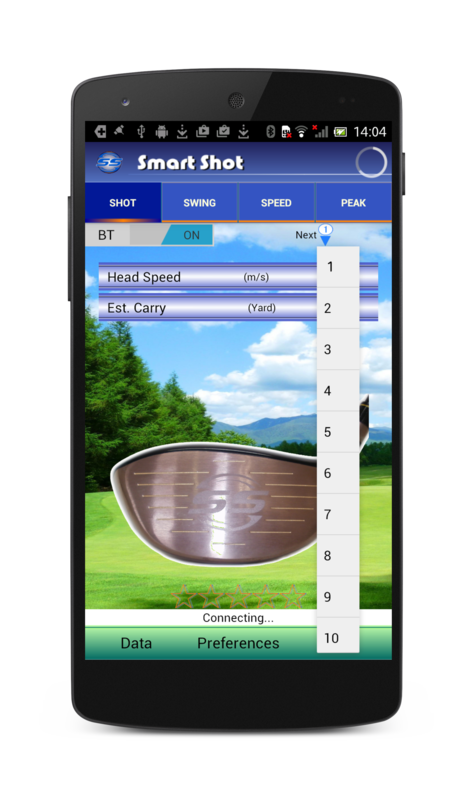 You can check the start time, the rotating speed, and the appropriateness of the direction of the face when it hits the ball. You can also compare your face rotation with that of advanced golfers. The shot speed tends to get lower when the club hits the ball. 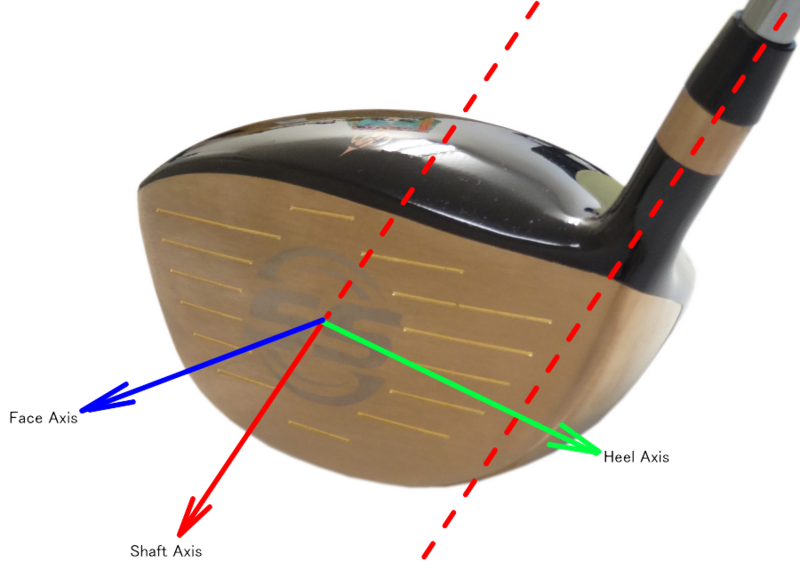 The head speed means the highest swing speed, and the hit speed refers to the speed when the club hits the ball. The difference between these types of speed is displayed as numerical data. 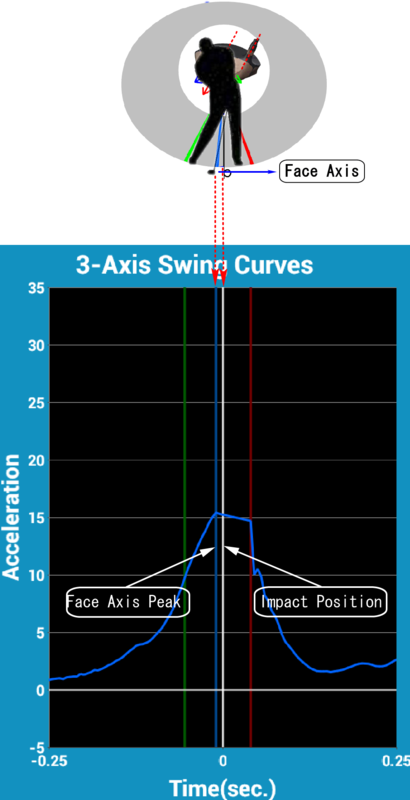 You can also check the graphs to see the changes in the head speed, and compare your data with that of advanced golfers. 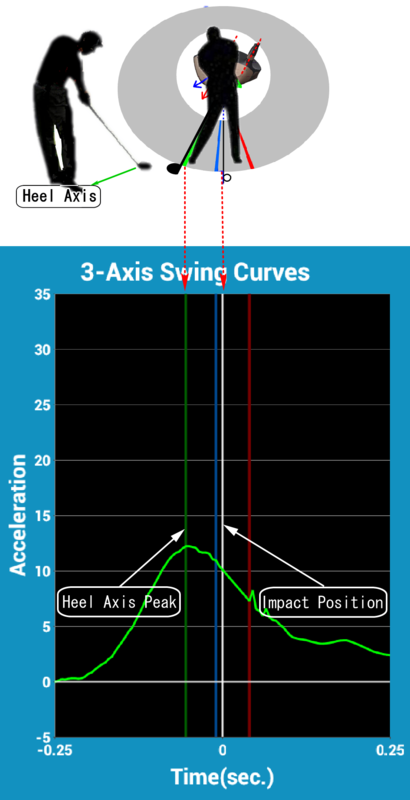 3 axes include an axis which is perpendicular to the face (face axis), the one toward the central shaft (shaft axis) and the one toward the heel (heel axis). If all the peak timing points of these 3 axes are almost the same as timing of the hit, the swing power can be maximized and allow the ball to travel further. Each peak timing of these 3 axes is displayed. And the curve of each axis is also displayed. 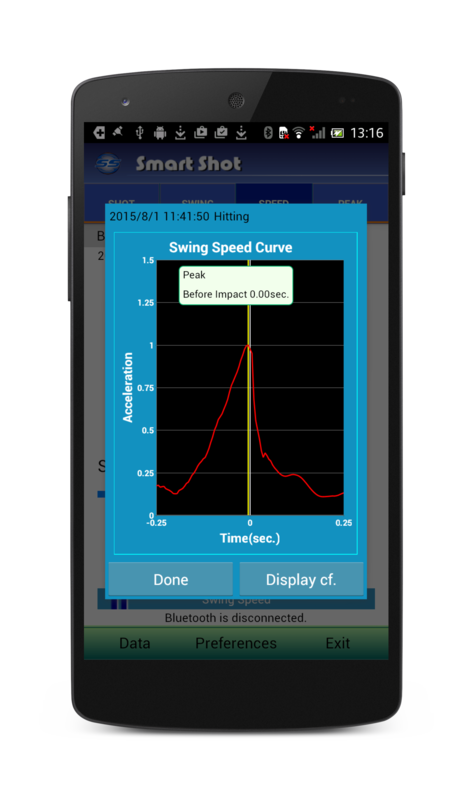 It detects and displays even practice swings (data related to driving points is not displayed). Data of hits is automatically saved. 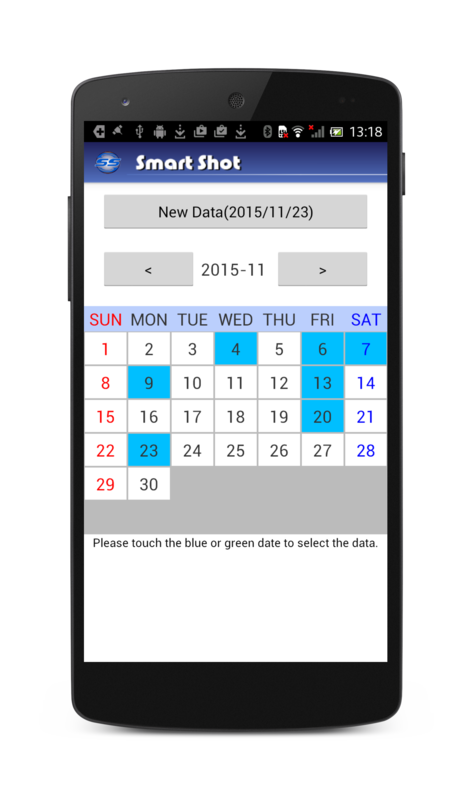 If you want to redisplay it, please specify the date on the calendar and select the data you want to see from the data list on that day. You can display all the data for one day at once. As you can check the distribution of driving points, average speed and timing dispersion, you can understand your own trends. 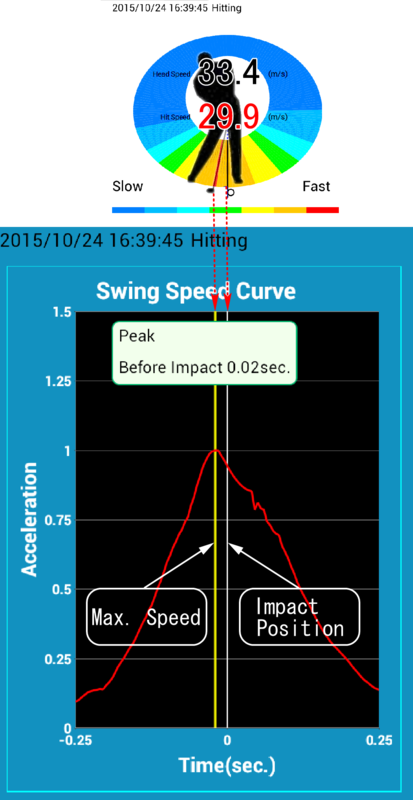 You can compare your swings with those of advanced golfers on the displayed graphs. 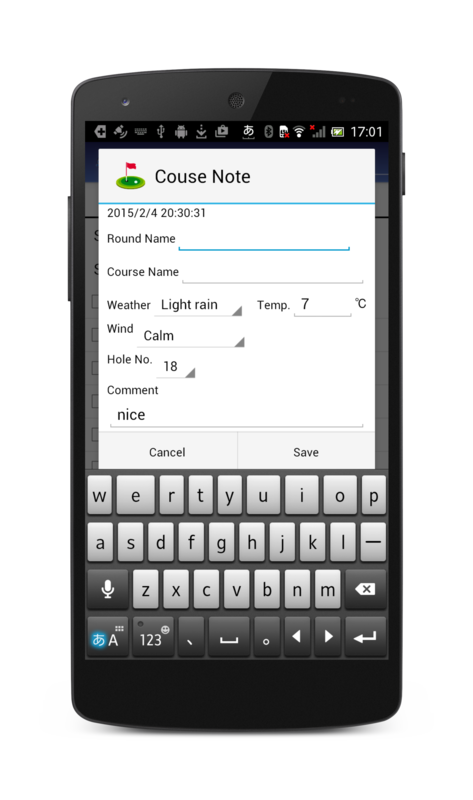 While the data of professional golfers is registered for comparison as default setting, you can change the setting (e.g. your best data). You can set up the course and link the data with the hole number. 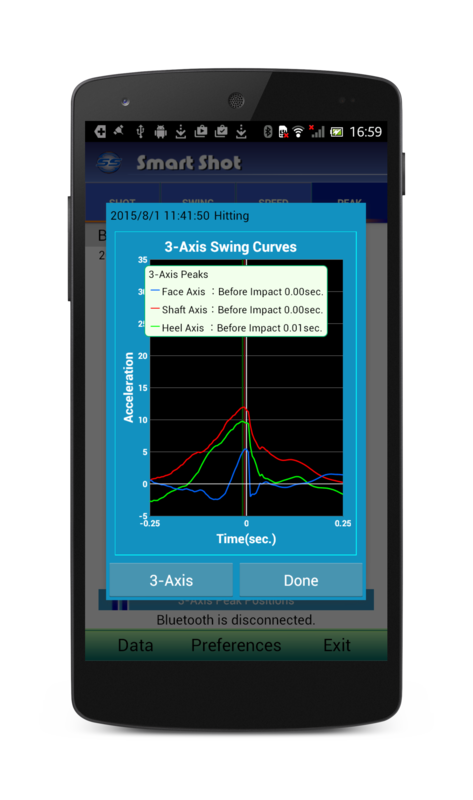 If you turn on the GPS function of your mobile device, you can save the hitting location with the data. In the course, you can save the course map and tee shot location. You can also save the ball fall point with the data by double tapping your screen at the ball fall point. Moreover, you can identify the hit direction of the ball and distance. The fall point of the ball can be saved with the hit data by double tapping the screen after hitting. And the direction and distance of the fall flew can be specified. 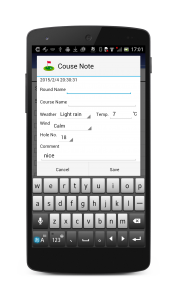 It provides “training notes” for practice, and “course play notes” for playing on a course. You can attach your notes and your instructor’s comments to the data. (※1) It may be changed by the battery and situation. (※2) It may vary according to neighboring electromagnetic environment. Please do not use this product in official competition. Download a apk file from here. Please click here to inquiry by the form.